Sometimes the things we do to make us look our best can end up having us look our worst. A major issue many experience and need assistance with is repairing hair straightener damage. It’s not uncommon to cause damage to your hair while grooming it. 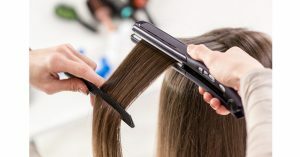 At RHRLI, we want you to know about the dangers and damage that can be caused when you try to straighten your hair and also what you can do to repair hair should damage occur. We believe in making sure you have a healthy head of hair, which is why you should make us your first choice if you’re concerned about hair loss or thinning hair. In general, it’s a good idea to avoid styling your hair too much with heat based tools. Blow dryers and hair straightening products may damage your hair. You also should be wary of hair straightening techniques that involve using excessive chemicals. Both of these straightening treatments can cause hair loss. Hair straightening tools take moisture from your hair and use it to create a new style. Cunnane Phillips, who practices trichology, the branch of dermatology that focuses on the study of hair, told the Huffington Post in 2014. The problem is that these tools can also make your hair brittle. Excessive use of heat can scar and damage the scalp, which could lead to permanent hair loss in extreme cases. Chemical treatments can also rob hair of its natural moisture. Chemicals can remove the protective lipid layer of fat that surrounds the cuticle located on the outside of the hair shaft, according to the American Academy of Dermatology (AAD) The cuticle is what makes hair shiny and strong. To repair straightened hair that’s been damaged by heat, the AAD recommends allowing hair to air dry when possible. Don’t immediately set your hairdryer to the highest heat setting. Start out at the lowest setting and gradually increase the heat. Look to use temperature controlled devices to regulate the amount of direct heat that goes to your hair. Another way to protect against direct heat, for example, if using a ceramic iron, would be to put a moist towel inside the device. Moisturizing hair regularly will help to some degree as well. If you’re concerned about chemical damage, you should use shampoo and conditioner regularly to improve the look of frizzy hair. Products containing dimethicone can improve manageability, while 2-in-1 shampoos, which clean and condition, can help remove oil from the scalp. Try not to dye your hair, but if you must, the AAD recommends you try to remain consistent with your shade of hair, and try to stay within three color shades of your natural hair color. You might want to try hair serums, but rub it on your hands and gently work it through your hair. Don’t apply serum directly to your scalp. Hair loss from damage done by hair straighteners can be permanent if there’s severe scalp damage. If you’re looking for solutions to hair loss or thinning hair, RHRLI can help. We are the only hair treatment center on Long Island that uses the ARTAS® robotic hair restoration system. Unlike other hair transplant techniques such as strip surgery, which can be painful and have longer recovery times, or hair transplant procedures that require doctors to use a hand-held device, the ARTAS® system uses robotic technology. This allows it to identify the healthiest hairs available for transplant and remove them with precision to facilitate placement where they’re needed. The result is a full, healthy looking head of hair. To get started, contact us today. Previous Post: « What Causes Male Pattern Hair Loss?